Built from the hull of the British HMS Resolute, as a gift from Queen Victoria, The President’s desk – aka the Resolute Desk – has occupied the Oval Office of the White House for some time now. Since 1880 it has seen much action from the Presidents who have sat behind it and made historical, world changing decisions. 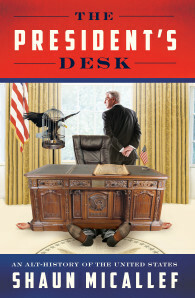 Now Shaun Micallef takes us inside the Oval Office, and, in a highly entertaining romp through American history, introduces us to the men who have sat at the desk. Micallef’s exploration of the widely varying personalities and traits of America’s presidents, paints a wonderfully alternative history of the US through an outrageous, absurdist re-imagining of their lives. Readers will delight in The President’s Desk and its enormous number of references to real people, places, events and culture embedded in the text amongst Shaun’s very entertaining comic storytelling style. As Shaun says “The President’s Desk is a history of America for people who can’t be bothered with accuracy”. Shaun Micallef is an Australian comedian, writer, actor, producer, author and bon vivant. After several years of practising law, Micallef threw it all away for a life in comedy and television. Since ’94 he has graced Aussie TV screens in shows such as Full Frontal to Sea Change, to his own gig on Micallef Tonight, Thank God You’re Here and Talkin’ Bout Your Generation – to name but a few. He has authored two books: Smithereens and Preincarnate, and received several awards including two Logies, an Aria for Best Comedy Release and an AFI for Screen Craft. He is married with three sons.